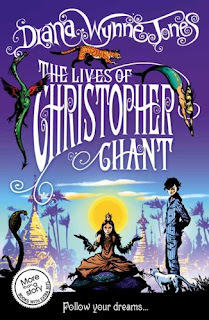 The second Chrestomanci book, The Lives of Christopher Chant, happens about twenty-five years before the first one. It has another nine-lived enchanter, a different Chrestomanci, travel to the related worlds, lots of death, and, best of all, Throgmorten, one of the Asheth Temple cats! This is a well-crafted story that has so many twists and reveals that it's a joy to explore. The last time I read it, I was apparently annoyed by Christopher but now had no problem with him. I think that his moodiness and mine must have aligned this time. Instead of being annoyed, I saw a kid that is being pulled in many different directions by family and obligation and is expected to do great things but at the same time is given very little reward or credit. I can understand why he would be so frustrated! The moment that his strength is acknowledged and respected, he lives up to it and becomes a better person. Question of the Day: When The Living Asheth gets to World Twelve-A, she needs a new name so that she can hide from The Arm of Asheth. She chooses Millie because of the boarding school books that she adored from Christopher's world. If you needed a new name, which bookish moniker would you choose? My answer: I think I might choose Celia Bowen (from The Night Circus) but would be tempted to choose Sophie Hatter (Howl's Moving Castle). My favorite fictional name is Thursday Next but I'm assuming that would draw too much attention and, if I've had to change my name, I'm probably trying to lay low. Jenny posted about this book earlier this week so head over there for more TLoCC love! Also, she suggests reading it first if you haven't read any of the Chrestomanci books yet and I agree. If you're into it, that's all that matters! This is a fun question. I'm going to say Charlotte (as in Bronte - are author's names allowed?) and Chant (as in the marvelous series we're discussing here). I love this book so much! I loved it way more on my recent second read, not sure why... Christopher is the BEST and I love Tacroy too. :) I had so much fun reading it aloud to younger siblings! And yes, Irene Holmes is a bit awkward but I still love the name, especially because Irene is my grandma's name.